The true story of controversial leader of independent Congo, Patrice Lumumba. Not as polished, but more visceral than "Hotel Rwanda"
I knew absolutely nothing about this movie when I sat down to watch it. And, I'm ashamed to say, I knew nothing about Haitian writer-director Raoul Peck's work, either. 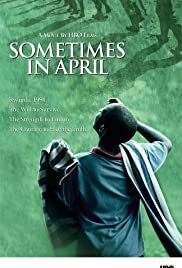 In many ways, "Sometimes in April" perfectly complements "Hotel Rwanda." Augustin Muganza (Idris Elba), Peck's fictional protagonist, winds up seeking refuge in the swank Kigali hotel managed by Paul Rusesabagina. Of course, Peck's actors - Elba, Carole Karemera, Pamela Nomvete, Oris Erhuero, Fraser James et al - aren't as polished as Don Cheadle, Sophie Okonedo and Nick Nolte, and his writing isn't as crisp as Terry George and Keir Pearson's script. 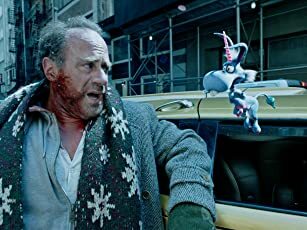 But Peck's movie still packs a hefty punch, thanks to honest performances and some wrenching moments reminiscent of "The Killing Fields" (1984) and "Schindler's List" (1993). Unlike George's Oscar-nominated movie, "Sometimes in April" doesn't tell just one person's story in the Rwandan genocide of 1994. It revolves around a few - Augustin, a moderate Hutu military officer; his brother, Honore, a radical preaching hatred against Tutsis and moderate Hutus on the radio; and Martine, Augustin's fiancée dealing with her own nightmares. Peck also delves into the aftermath of the genocide and the International Criminal Tribunal in Tanzania. The trials against the war criminals serves as bookends for Peck's plot. It's not a novel device using flashbacks to tell the story. It serves the film, though it's one of the unpolished qualities about Peck's movie. On the other hand, it speaks to the importance of bringing those thugs to justice and also of the survivors' need to tell the world what happened and moving on with their lives. The performances, for the most part, are rough and raw. That works to the film's advantage. Peck's dialogue isn't exactly crisp. In fact, it seems stilted, at times. But because I didn't know any of the actors by name, their performances held a certain kind of honesty. I was somehow more drawn into their stories than I would have been had, say, their roles been played by better known Americans or Britons. There are two familiar, recognizable faces - Debra Winger as Assistant Secretary of State Prudence Bushnell and Toby Emmerich as a U.S. military man, both frustrated at being unable to convince their superiors that the United States should get involved to stop the massacres. Peck gives us a more vivid picture of the slaughter than George did. Peck shows us the huge scale of the massacre. The scenes unsettle us, make us shudder. We see how otherwise considerate, rational people, such as priests, were placed in a horrible bind when faced with possibly giving up some of the children in their care to save others. Contrary to what some might say, Peck's film isn't anti-American. It's appalling that western nations sat idly by and let these horrific crimes take place and Peck rightly indicts them for their apathy. What Peck does is capture the United States' reluctance to help stop the massacres because the Clinton administration feared another Mogadishu. Let's face it, the American media and government cared little about what was happening because it was happening in Africa and it's a continent the U.S. cares little about. American media was keener on covering Kurt Cobain than the slaughter of tens of thousands of Africans. Even today, the media and public care more about a pop star's trial and a cute, young white bride getting cold feet than another genocide in the Darfur region of Sudan. But it's tough to tag Peck as anti-American when he uses real footage of a State Department news conference where the spokeswoman tries to convince the press corps that although there have been "acts of genocide" committed in Rwanda, what was happening wasn't exactly "genocide." The absurdity of the government's argument, the Clinton administration's parsing of words as it tried to weasel out of committing troops to stop what was clearly genocide, is clearly illustrated when a reporter asks, "How many acts of genocide does it take to have a genocide?" The spokeswoman answer is a marvel in government-speak. True, Peck has the luxury of hindsight to put words into characters' mouths. One Rwandan military official opines the U.S. won't intervene because there's no oil at stake and, later, Emmerich's character predicts what Clinton would do years later. Of course, Clinton apologized later for not intervening to stop the genocide, though it was of no help to those who lost everything. Maybe some day, George W. Bush will apologize to the world and Iraqis for waging an unjust war to prove his mettle and getting absolutely everything wrong leading up to and after the invasion. Yeah, right. Peck is correct to attack the United States' apathy toward what happened in Rwanda. We can't insist on being the beacon of freedom and democracy to the world and then turn our backs when hundreds of thousands of innocent men, women and children were being slaughtered. However, Peck doesn't limit his scathing attacks to the U.S. He also criticizes France for its complicity. We see the Rwandan military praising France for providing weapons and, later, we see how the French helped get war criminals out of Rwanda. "Sometimes in April" could have been more polished. And Peck could have paced his story a bit faster. But those are minor quibbles. Like "Hotel Rwanda," this is a movie that must be seen, if not to see what happened 11 years ago, then to find out how the world's most powerful nations disgraced themselves by doing nothing while 800,000 innocent men, women and children were brutally slaughtered in a mere 100 days.